When it comes to talking to Latinos on a large scale, festivals are the place to be. Feria Chapina, in Los Angeles California is the biggest community event catering to the Guatemalan’s in the area. With local performers that traveled all the way from Guatemala, to traditional food and arts and crafts, Chapina (as most call it) was THE event of the summer. Claro is a recharge system where you can send airtime to your family in Guatemala, El Salvador, Nicaragua and Honduras so they can make local or international calls with their phone. This is very beneficial to the Hispanic community as they feel the need to help the family that they have back home, this is an alternative to the typical “remesa”. One of our performers was Ekaro, a Guatemalan singer, who played the djembe at our booth, this attracted lots of people that were moved by the familiar sounds and lyrics. Even I (a musically challenged girl from Puerto Rico) was moved by it, and Ekaro took the time to teach me the basic beats of the djembe. Customers walked away happy because they understood the product. Additionally, customers who passed by our booth walked away with fans, water bottles and visors (all weather friendly items, especially since it was 90 degrees out). Those who recharged or participated in the various fun activities took home Claro bags, key chains, flashlights, recharge cards and even bicycles! 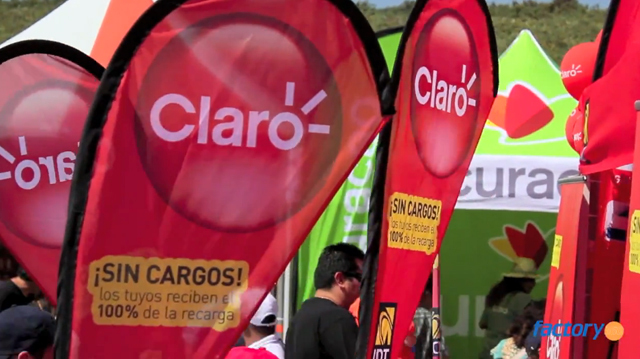 The Guatemalan community was very welcoming of the Claro activation at Feria Chapina. The Multicultural Group at F360 understands that the Hispanic community is very welcoming of fun, familiar and inclusive events. Therefore, we took a typical activation and transformed it in a fun and creative one by adding live music, dancing contests and bike raffles. This gave us the opportunity to interact with customers one on one in a more personal way.